This is my story about my Mother’s Breast Cancer journey. October is National Breast Cancer Awareness Month. 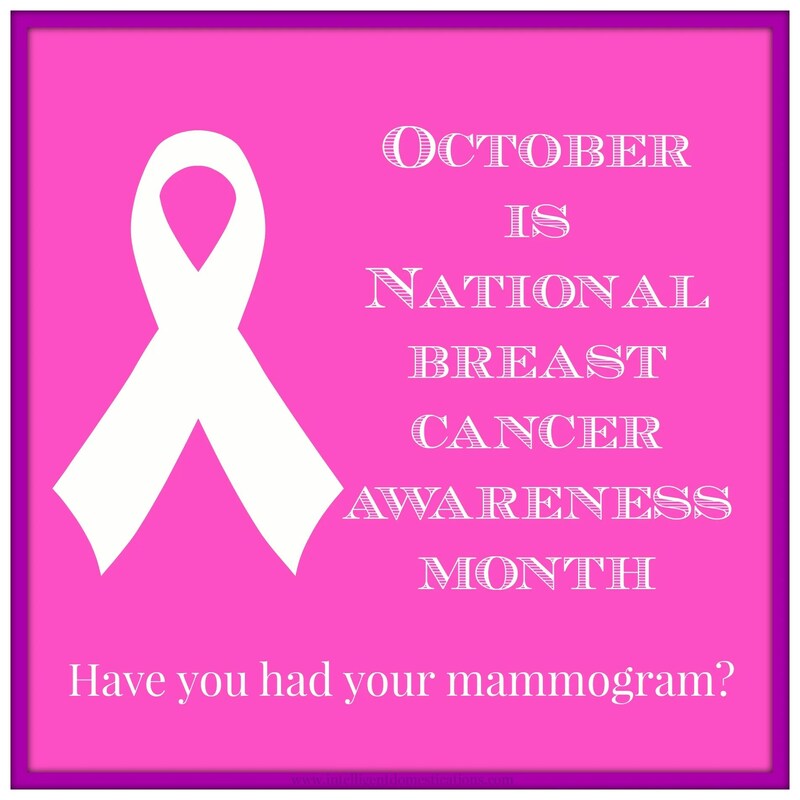 Please go for your annual mammogram if you have not done so already. I hope you are encouraged or can find strength in my story. I remember vividly. I was working second shift as a waitress at the Waffle House. My Dad came in, sat down at a booth and motioned me over. He wanted to tell me that Momma had been diagnosed with breast cancer. That was the first time. Radiation and removal of lymph nodes were the treatment. She got off easy. Fast forward a few years. Again, I remember vividly. I was working an Internship at Goodwill Industries in the Homeless program the day I got the call. Those dreaded words, It’s back. Still no chemo. Momma did not want chemo because she did not want to lose her hair. Radiation was not an option. This time it was a mastectomy. Momma was so courageous. She never once complained about what was happening to her. She just took each day as they came and looked forward to a better day. She did not become sick. The mastectomy saved her life. We dodged a bullet, again. Twelve years after the first diagnosis, here we go again. Momma lived with me now because Daddy was living with Jesus. I noticed that Momma had a swollen gland in her neck and insisted she go to the doctor. I don’t know why but I had a bad feeling. During the few days she had to wait on her appointment, that lump in her neck moved. We literally saw that it had moved further back until it actually was no longer visible. The surgeon saw it and examined it on her first visit with him. During pre-op when the surgeon came in to see her, the lump was not visible at all. He almost chocked her to death trying to find it! Surgery took significantly longer than originally expected. I considered that to be a bad sign and I was not wrong. Somehow, you just don’t believe this is really happening. You know it is true and you really are living this horrific experience but you just somehow don’t accept it as reality right in that moment. The doctor did not mince words when the call in the waiting room was finally for me. I don’t mind that, I want the truth. I just wasn’t expecting what he said. Thankfully, I was not alone that day in that waiting room. There were lots of grandchildren and great grandchildren present. Momma was much loved and a very important person to all of us. The breast cancer is back and has metastasized into the lymph system. That swelling had rested in a gland behind the jugular vein which is why the surgery took so long. According to the Oncologist, it was definitely not the same cancer as the first two times. Unfortunately the gland removal did not provide an answer to the type of cancer. When he spoke of chemo, he talked about a cocktail of 5 different meds mixed. It was basically throwing a pile of stuff at a wall with the hope that something sticks. He explained that this mixture of chemo meds would make her very sick and she would most likely lose all of her hair. He further stated that about the time she would begin to feel better after one chemo cocktail treatment, it would be time to take another treatment. We discussed all of this with Momma at length. We were all careful to try not to tell her what to do but allow her to reach the decision on her own. We felt like it had to be her decision. Once she said that she did not want chemo, we breathed a sigh of relief and shared that we supported that decision completely. Momma was 72 at the time of this diagnosis and she had other serious health issues. I was afraid that chemo would destroy any quality of life. It’s a really tough decision. Momma said No, to chemo but she agreed to participate in a cancer study which could potentially identify her exact type of her cancer and possibly help others. It was 2012 which was big year in my family. My daughter was planning her wedding. My niece was expecting a baby. It was supposed to be a happy time. We involved Momma in everything she felt like doing. The diagnosis came in the spring. By early Fall, it was obvious she didn’t have the energy to hold out for family events. We took a lot of pictures at our Sunday dinners. The wedding was Jan. 20, 2013. Momma didn’t have the energy to go shopping for a new dress but she sure did want one. My husband and I went shopping for her. We found the perfect dress in one of her favorite colors to wear. It fit perfect and she loved it so much she asked me to be sure to let her wear it for her final resting. You don’t want to have those kinds of conversations and you don’t feel like you may even be able to, but God gives the strength from somewhere deep when we need it. Above photo, Left is Tresa, my oldest daughter, Momma receiving the kisses and the Bride is my baby girl, Tiffany. That’s me in the back. In the Spring of 2013, Momma was still driving herself into town to go grocery shopping which she enjoyed doing. She really fattened us both up during the years she lived with us. Momma believed you should have a meat, two vegetables and a bread on the table for the evening meal. Dinner was on the table within minutes of us coming in the door from work every single day. Andy Griffith came on TV at 5:30. The three of us watched and laughed at Andy and Barney while we enjoyed our dinner at the table every day. Momma’s favorite episode was always when Otis bought a car and Barney used toy cars to try to teach Otis the rules of the road. It makes me smile to think about it. 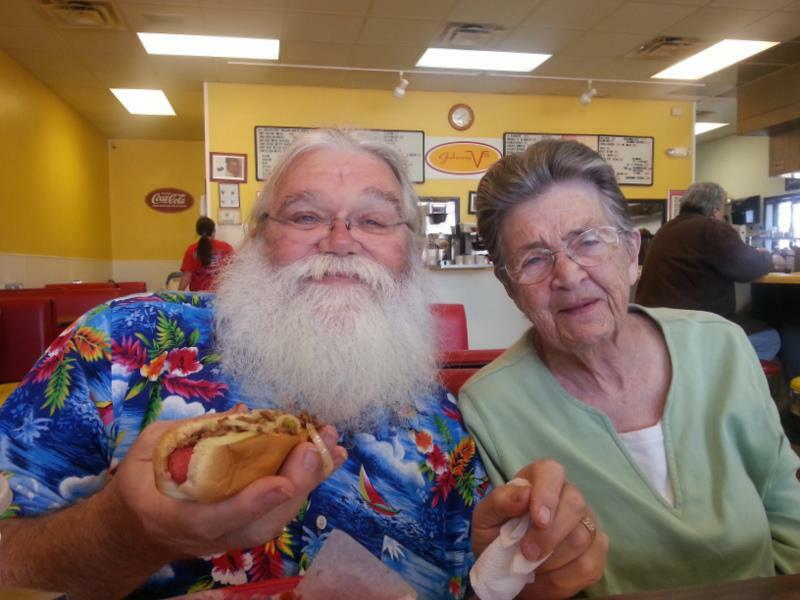 Above photo,This is my Momma and my cousin, Billy having a hot dog at a local eatery, Johhny V’s. Billy looks so much like Santa that a couple of children came over to him to speak to Santa while we were there. He played along and we all had a good laugh. This photo was taken exactly 7 days prior to Momma going to live with Jesus. When my cousin Billy came for a visit, Momma was really very sick but we didn’t realize how much. That Saturday when we came back home from eating at Johnny V’s, she was so exhausted. She had only taken a couple of bites of her hot dog. We didn’t realize she felt as bad as she did because she was so happy to be visiting with Billy, she never let on how tired she was. She and Billy sat up until the wee hours of the morning talking and she loved it! Momma had come into the Den one evening several months back and boldly stated to me and Stacy to put her in the hospital when it came time for her to die. Again, these conversations are hard but God does give you the strength. I asked her if she wanted to die in a hospital or at home. She replied, Home but y’all don’t want me to die in your house. My husband and I did not even need to talk about this, we both knew she was never going into a hospital. We had every intention of taking care of Momma at home. We told her this and she cried a little because it made her happy. That last week, the grandchildren, all grown with their own children, were in and out of the house constantly. There was a great deal of visitors who came to spend time with Momma. She loved every thin minute of it. Friends and family are so important during these times. The night before Momma passed, some of the grandchildren gathered in her room and had a Bible study with her. She asked Tiffany to read from the Book of James. I think she read the entire book. It is a fond memory for them now. Tiffany and I slept on the floor on a pallet in Momma’s room that night. It was a long night with very little sleep for any of us. The next day, March 16, 2013, Momma went to live with Jesus. It was my Daddy’s birthday. We found that to be comforting in a strange kind of way. We were all standing by her bed with her. I think my mother was very brave. I don’t know what else you can be when faced with terminal breast cancer. If she had not been brave and strong, we would not have been able to be brave and strong either. This is my story of the journey through my mother’s breast cancer. There are more details which I have left out. I kept a journal of every single doctor visit, every med which was administered and all the details we felt like we needed to remember. Momma taught us to keep this kind of journal when she nursed my brother for 4 years prior to his death. I still have Momma’s journal but I can’t read it. I lived it, I don’t need to read it. We enjoyed taking Momma to a wedding shower and a baby shower that year. If you are now or have gone through a breast cancer journey with a loved one, my only advise is Be Strong. Be strong so you can cherish the days you have with your loved one. Share your story because it may bring encouragement or comfort to someone else. Thank you Diana for those kind words. My mother has been the only member of her family with breast cancer. It really is good therapy to talk about it, especially with others who understand. I re-live her journey in my mind on a regular basis. I am so happy for you to be cancer free for so long! That is awesome! Such a touching story. I actually just left a career in cancer and AIDS research, although it was more general immunology than targeted towards a specific cancer. It’s stories like these that remind me that the goal of finding a cure is so important and affects so many people. I am glad that you got to support your mom that way and that she was able to see many more milestones in life. Thank you for sharing your story. Rachel, thank you so much for taking the time to comment. Your words are uplifting. I appreciate your career in research because it is so very necessary if we are to ever win the battle. Such a touching story, Shirley. Your mom seemed like a very strong woman. I don’t think I know anyone in my family that has breast cancer. Thanks for sharing your story. It is wonderful for your family to not be attacked by breast cancer. My Mom is the only member of her family to ever have it. There are many stories of survival which continue to offer hope to others. Losing a loved one is a very difficult thing to go through. You are absolutely right about being strong and enjoying your time with them while you have them. Thank you for sharing your story. It is helpful to talk about it now. Somehow talking about it helps with the healing process. When we are going through things, we are so busy being occupied with that thing, we don’t have time to process the reality of it until much later. I hope my story will encourage others in some way. Thanks for sharing this inspiring and heart-felt story. My mom passed away from breast cancer back in 1999, 20 days before her 70th birthday. We spent lots of time together. At one point she told me, “I don’t think I’m Y2K compatible.” I cried and laughed all at the same time. Like you, I have wonderful loving memories of my mother… we are blessed. Lorelai, I am so sorry that you lost your Mom to breast cancer also. There are moments along the journey, like the one you shared, which are precious memories to hold onto later. I completely understand. This story made me laugh and cry. I laughed when you said your mom didn’t want to loose her hair because that’s me and I cried when you told about that dress and when she passed. And I am so so glad you have the blessed assurance she is with Jesus and your dad. Thanks for sharing your experience. Thank you for such sweet, kind words Amanda. How in the world anyone ever gets through life without Jesus is beyond me. That precious hope is what gets me through the worst times in life. Your story is so full of love! Thank you for sharing! Shirley this story is very similar to what we just went through with my MIL, who passed last year and was diagnosed with cancer (My dear hubby has now laid three parents to rest in the past year – his mother, father, and step-father). By the time her cancer was detected, she had cancer in her lymp node system as well. I’m crying so much as I remember our family doing the exact same things as your family did. We had a lot of family gatherings together with lots of pictures. Erlene, it is so important for families to bond even tighter during these difficult times. I feel your pain as you share what your family has experienced. It is just so wonderful to have a close loving family! WOW. First of all, I LOVE LOVE LOVE that picture from the wedding! What a special memory! Second of all, I have to say that you are one special lady for taking such good care of your momma, Shirley! I don’t think you will ever know just how much that meant to her. And third, thank you for taking the time to share this with everyone. I know it will help those living it! That picture from the wedding is one of my favorites. We asked the photographer to get lots of pics of my Mom and he did. He was just awesome in every way! I have tears running down my face, Shirley. I read every single word! I’m so very glad that you were able to spend so much time with your mom before she went to live with Jesus! And I know that she is so proud of the woman that you are! My mom and dad are in their early 80’s and in good health, but I know that it won’t last forever. And thanks for reminding me to get my mammogram! Have a blessed day! Alli, I had a little bit of a hard time writing it and had to take a break several times. I did not take my mother’s death well at all. I sat at home, grieved and gained 15 lbs. which I am working very hard to lose now. Time is really the only thing that makes living without someone you love easier. If Momma had not been so strong for us, it would have been more difficult. Thank you for your kind words. Enjoy your parents as much as possible, they are just so precious to us.